Propane fueled vehicles could be taxed under a bill being considered by a House committee. Bill sponsor Craig Redmon (R-Canton) says alternative fueled vehicles should pay their fair share. “They’re basically getting a free pass on paying anything towards our roads,” says Redmon. He tells Missouri the revenue generated would help fund work on Missouri’s roads and bridges. 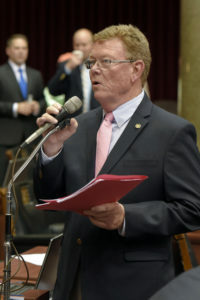 State lawmakers have been butting heads for years about how to increase funding for Missouri’s transportation system. The state’s motor fuel tax has not been increased since 1996. Redmon is considering whether the tax level should match the motor fuel tax, which is currently 17 cents per gallon, and graduate to a different level if the gasoline tax changes. How much could be generated from the tax is unknown. Redmon also says there is no cost associated with implementation of a propane motor fuel tax. Under his bill, propane fueled vehicles could continue to apply for and use annual alternative fuel decals in lieu of paying the tax. No decal is required for vehicles that fuel at stations collecting the new propane tax, however, there is no refund policy for vehicles with decals that choose to obtain fuel at unattended stations where tax is automatically collected at the point of sale. The committee has not voted yet on the measure.